Do you really think Phunsukh Wangdu (Aamir Khan, 3 Idiots climax scene) receiving a call in the resplendent Pangong Lake in Leh with a ringtone that matched with what AR Rahman made for Airtel was a coincidence? Or Hrithik Roshan’s insistence on Bournvita – being the secret of his energy (pun intended) in Koi Mil Gaya / Krissh was his only choice? Well, not entirely! Brands and movies have had a long-standing relation and the popular jargon for this is Product placement or In-film advertising. In layman terms, product placement is the promotion of branded goods and services within the context of a show or movie (or even personal videos) rather than as an explicit advertisement. Whether it’s good or bad, successful or not, paid or free can be understood a little better as you read along. Just a disclaimer, most of this is in the context of Indywood (for Hollywood aficionados here’s a good read). In terms of statistics, it’s said that the Indian movie industry is the largest in the world in terms of number of films produced with around 1500 to 2000 films produced ever year in over 20 languages (for context that’s an average of 5 movies/ day or 1 every 5 hours; less than an average Mumbaikars everyday work commute). Even if I cut the exaggeration, that is indeed a very high run-rate, so it was obvious that some bright mind had to use movies as an effective advertising platform! But the earliest traces of product placement weren’t necessarily only seen in Indian movies, after all product placement is a big phenomenon in Hollywood movies and Americans love both their movies and their brands! It’s said that the first movie to have featured a brand was a silent film called Wings (year 1927) which prominently placed bar of Hershey’s chocolate. In Indian movies, this phenomenon was said to surface in late 1960’s, Madam Senior Pataudi (read: Sharmila Tagore) was seen sipping delicately from a 200 ml bottle of Coke. It works both ways, sometimes brands pay movie marketing agencies for their product to be integrated into the plot of the film, who in turn reach out to production houses and there are times when production houses reach out to brands. Sometimes a brand has higher power than a movie, I mean one example is Air India – it’s pretty much the Airline for all Indian movies (and I don’t think they pay to be featured), remember Italian Job in 2003 (BMW did not pay them for mini cars to be featured, instead they just gave them 30 cars to be used). 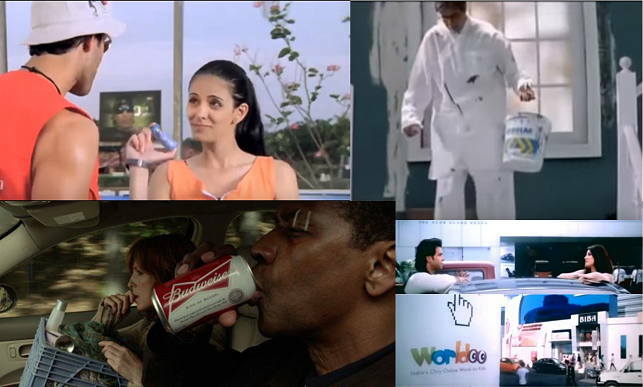 A lot of production houses find product placements as an effective way of funding their movies. I mean think of it as selling ad-space within a movie and since the audience is a captive one it does get the brand noticed (whether the audience likes it or not). It’s said that Tata Motors paid TVF one million dollars for the association for Tripling and I must admit that Tata’s Tiago almost seemed like the the fourth sibling. They are there to watch the content not your ad. My favourite example is of the movie Krissh 3 (although I couldn’t ever manage to finish this movie in one sitting, brand integrations everywhere were overwhelming). it can lead to a lot of flak. For example, Denzel Washington as an alcoholic pilot in the movie Flight who regularly slugged back bottles of Budweiser, apparently Budweiser VP had to ask Paramount pictures to remove the brand. Remember Yaadein and the Pass-Pass (yes that same mouth freshener). In my humble opinion, it had no relevance to the plot of the movie, it featured right after a cycle race and to top it the protagonist had to mention the brand in his dialogue. Ghai-oh-Ghai!!! No doubt that we can’t get our eyes off the protagonists, but it’s critical to understand if the product sits in with their personality as well. For instance, I remember Big B in Virrudh taking Nerolac paint cans and deciding to repaint his home. Well, not so good if you ask me. I mean they could have had the right people do the job while still retaining Big B in the frame. Know what your brand DNA is and then find the right content around it. Like Alia Bhatt in 2 States (was supposedly an IIM A graduate) so being employed with Sunsilk as an Area Sales manager seemed digestible. Let’s take her overall IQ level with a pinch of Tata Namak! #PresidentofIndiaJoke #KoffeewithKaran. Another one in recent times was of Home Centre promoting their online shopping and delivery through Saif Ali Khan starrer Chef. consumers do notice brands. Did we all not notice Chatur Ramalingam of Rocklage corporation drive Volvo S 80 in the beautiful hills of Himachal or Katrina follow Hrithik on her Royal Enfield 500 in Spain. If you thought using a product without the manufacturers’ permission was cool, think again!! Brands are protected by copyright infringement and usage rights so don’t wake up one morning and put in a brand you like, it could cost you a fortune. This goes out more to content makers rather than brand managers. If you’ve noticed there are times when brand logos are morphed, if featured unintentionally. I’m no expert on product placements but as a movie buff with almost 25 years of experience watching movies and now Web content, I’ve noticed several brands, at times purchased them if they weren’t in my face and a turnoff. What works is good content, the right product fit and of course big moolah, doesn’t it? Credits: The copyrights of all images used in this article belong to the respective production houses. Akshay is a Brand & Auto enthusiast from Mumbai. Currently, he manages the Digital Marketing practice for Landmark Group based out of Dubai. He loves plane spotting, food tasting, dramatizing and pool plunging. Hi. I wanted your E-mail id to have a long conversation with you. I want to be a brand manger in the future but right now just a graduate in commerce field. Is MBA really necessary or i can start working and gain experience straight and leter think about MBA. Also, which all companies are top ones to apply for? Feel free to share your query here, it’d be nice for fellow readers with similar questions. I’d be happy to answer these. Very unlikely that your first job will be that of a brand manager, even those graduating from IIM’s of the world, start of in Sales roles and then progress into brand management. So before you wish to pursue a course, know everything about what’s expected from a Marketing/ Brand manager – Is that a career you’re willing to invest the next 30 years of your life? To do an MBA now or later, is a purely personal choice – If you can manage to get a job that’s relevant with your career expectations, I’d recommend you take this up now and build some experience before hitting a full-time 2 year program. Be picky about doing a job that is going to add value towards your MBA – No use working in a finance or HR role if you ultimately want to pursue something in marketing. Again, the choice of school needs to meet with your post-MBA career outcome – pick schools that are known for their marketing orientation – like a MICA or IIM-K or SIBM Pune. While pursuing your pre-MBA job, do some part-time skill building in things like digital marketing and analytics. In today’s times, brand managers are expected to have a thorough understanding of digital media. Treat this particular job as something that will give you the learning and exposure before you arm yourself with the academic knowledge and the MBA degree, forget the money for starters – aim to learn. Still early days, so don’t be myopic about choosing a company – basis it’s size or Forbes ranking alone. Ask yourself some of these questions.